Paradise Lost's 2015 album 'The Plague Within' was a spectacular return to the death doom sound that put them on the map, albeit with a palpable 25 years worth of extra musical experience under their collective belt. The result was simply stunning, especially for a band that has flirted with multiple styles and genres throughout their impressive discography. A new label and a new album in the form of 'Medusa' inevitably raises expectations considering their final album on Century Media two years ago. Album number fifteen picks up where 'The Plague Within' left off. Where its predecessor embraced and reclaimed their early death doom sound, 'Medusa' sees the band dive headlong into their slowest, sludgiest doom output yet. The opening gothic organ of 'Fearless Sky' sets the tone for the album, sinister, grand and dark, the song proper that follows is a behemoth of death vocals bludgeoning drums, and slow but epic guitar riffs that demands devil horns be raised and heads bang. Songs such as 'Gods Of Ancient', 'The Longest Winter', 'Medusa', 'No Passage For The Dead', and 'Until The Grave' carry one the form set out in the opening track to great effect. 'From The Gallows' and 'Blood And Chaos' up the pace a little but don't loose any of the heaviness. There are some nice nods to bands such as Type O Negative and A Pale Horse Named Death in the albums more melodic and cleanly sung vocals which works really nicely against the bands thoroughly British death doom core that they pioneered. The production is nice and gritty in places where it needs to emphasise the heaviest aspects of the tracks but remains as polished and high quality as you'd expect a veteran act such as Paradise Lost to go for. This means the album moves with ease between the harshest tones to the more melodic ones, maintaining it's crushing atmosphere but allowing the music room to breathe and evolve throughout the tracks. Fans of their more commercial electronic/industrial rock and pre-2015 melodic doom releases will probably find this harder to get in to than 'The Plague Within' perhaps. 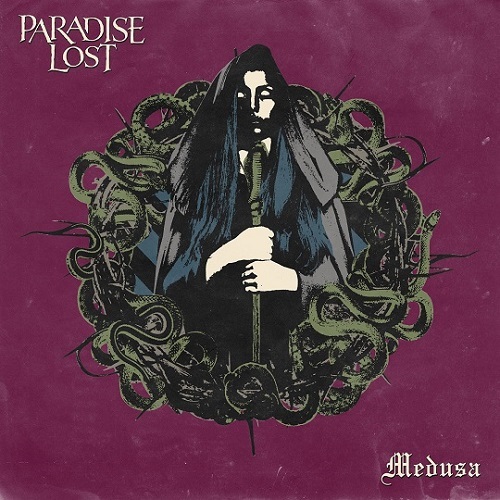 But for long-time fans that have followed the band's evolution from their death doom beginnings and through their commercial height and back again will continue to find vindication and solace in the unabashed heavy doom of 'Medusa'.